Considering in detail Örsteds experiment showing electric force and magnetic force are linked, I am drawn by the fact that the demonstration only works one way: with the wire facing east to west. Recall,now how Ed specifies that everything in his book on magnetic currents is oriented in specific directions. Örsted did experiments written in a Latin paper confirming a " circular" magnetic field., presented in 1820. What this means was not clear, but Oersteds philosophy and experiment led him to conjecture some lateral effect of magnetism ultimately from magnetism, but via an effect of of magnetic opposites called electric current. Now Arago is the one who did the experiment with iron filings around a wire in a vertical direction . 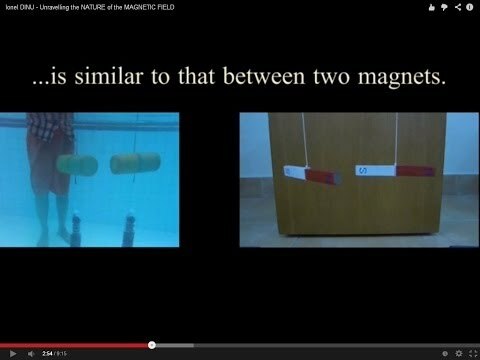 What he showed was that magnets follow the "Faraday" field lines , or Faradays magnetic force lines. The significance of Oersteds demonstration is over emphasised, to promote Örsted's Philosophy, but it is known that the interaction was submitted to the Royal,Society 2 decades prior to,Örsted. It was simply ignored by scientists at the time because there was no practical use or commercial interest. Arago demonstrated that a rotating copper plate couples to a versorium, a kind of compass needle . He then showed that a compass deflects around a wire carrying a voltaic current. The conclusion is that magnetic poles are circulating round the wire! It is simple and Ed states it simply. But those misapplying Örsted( and misinterpreting him!) make a pigs ear out of it! 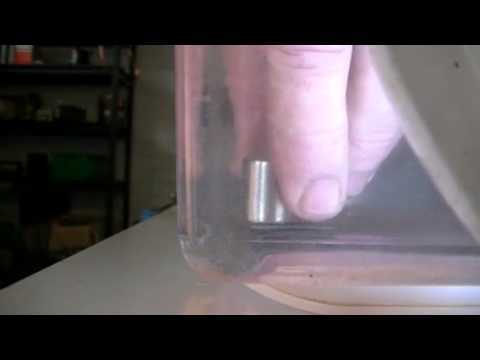 A magnet points toward a south magnetic region if it is a north magnetic region. Thus for a compass to point round a wire carrying a " current" means that magnetic region is in dynamic swirling motion round the wire, regardless of Earths north or. South poles. Arago had seen this coupling before, when he rotated a copper disc. So was the voltaic cell rotating the copper wire ? Clearly not, but what it was doing was rotating Volta's" Atmosphere" around the wire . Volta's atmospheric explanation of electricity production between 2 metals was rejected in favour of a chemical reaction explanation promoted by Galvano. But Arago had demonstrated the existence of such a rotating atmosphere . Still it was separated from the current upposedly flowing in the wire. There is no current that flows in a wire. The only evidence we have is of a rotating magnetic pole or poles wrapping themselves round a wire. Even now we teach that "Charge" exists only on the outside of a wire! To cut through this deliberate confusion, brought about by men with commercial interests, we do not need a polar concept . A vortex concept explains everything and more. In addition the concept of an electron and electon spin I say totally confuses what is more simply a vortex spin . There is a simple remark,and a conjecture to be made.in all the confusion it is clear that the wire does not behave like a magnet! I do not think Ed even remarks on this because he has deduced the vortex consists of 2 spins travelling in opposite directions against each other with the same gyre. What this means he does not fully specify, but observes that the spinning magnet poles spray off in the direction of the north south alignment. The wire gets hot but it does not become a magnet. The cross steel wires become magnets. My conjecture is that if a steel wire was used as the conductor it would not become a magnet either! Conveys magnetism. What does this rotational Tribology do? It would seem it passes on a vortex which is greatly enhanced in alignment to the earths magnetic vortex. In addition I note that the writings of Örsted and Ed bear a striking enough resemblance to suggest that Ed was also aware of them, and probably more so than Gilbert's De Magnete. But both works are of a piece conclusions drawn from empirical data, but research inspired by a philosophical insight. I have now completed a survey of Volta's works and life, and must correct one idea I had misunderstood. Galvani introduced the idea of electrical charge flowing in the body like the Leyden jar. He used the notion of 2 fluids which was received with awe. Franklins positive surplus idea thus was not yet adopted as a standard model fr electrostatics. Volta however was making considerable contributions to the technology of electric fluids. It was Galvanis theory that animal electricity existed in the body between nerves and muscless, requiring only a metal conductor. The notion of a conductor was not fixed as it is today, the fluids flowed through it, and so it was likened to a pipe., but it was not confused with a pipe. It was not known precisely what was going on. Volta on the other hand eventually by multiple experiments and demonstrations was abe to argue a concept he called ordinary or Metallic electricity. His demonstrations eventually won over the scientific world. Much of his research is still relevant even today. He showed that electricity can be produced by contact of virtually any 3 different material that would conduct it. Because he had created instruments capable of capturing measuring and storing this electricity he was able to convincingly demonstrate this. However the first class material were 2 different metals and a moist conductor between them , making a triad of conductors required for a continuous current to glow. Volta in fact describes these " currents" variously, because their phenomenology varied from acid to alkali taste, to thinking and ulcers and visible sparks.. To consider a current as a flow of charges is thus a compromise description . Thus Volta triumphed over Galvani in describing the the source of animal electricity, but his explanation of how it worked was not accepted. Instead they chose to use Galvanis 2 types of electric fluid model for charge in the triad circuit. Later again this was modified to use Franklins positive excess model. Today we have the electron excess model, but most engineers still use franklins positive excess. The circuit triad is usually represented by the two plates of a battery connected to a load. Why pick out Volta, seeing as he did not know what electricity was, and who constantly described it as 2 fluids? Because he carefully and experimentally adduced how it worked , and always refined or revised his ideas on the evidence, with skepticism. This full description of Volta's theoretical development and attitude, plus his style give me several connections to make. The theory of atmospheres was not Voltas but a standard concept of the time. This was displaced by Voltas own instrument, the Electrophorus, which caused philosophers to adopt action at a distance rather than atmospheres , and Volta eventually accepted this consensus view. Clearly at this time no one had revealed the " atmosphere" by iron filings, despite the incredible electrostatic implements. They looked for behaviours not spatial deformations. Volta believed that the electric fluid was attractive , not self repulsive , but he only used one fluid like Becania a Franklinist, while others in Europe ussed 2 like Galvano. The origin of the notion was Symmetre. There are a few details of interest about his philosophy of equilibrium of the fluid force and how it dynamically redistributes. These are like modern induction theory, but again without the notion of charge. The details are interesting but the relevance is again empirical data from experimentation inspired by philosophical conjectures or beliefs. Ed adopted this approach in coming to his conclusions. Again Volta supplies vital details about the triboelectric effect which inform any person working with materials about how to get electric fluid out of a stone! To clarify my opinion: I believe that the early conjectures of Volta form the essential modern concept of electric magnetism prior to Einstein. This rich vein of ideas and neglected theories and philosophies was tapped into by Ed in his concise explanation of it all. Ed was no more right than Volta or Örsted or Faraday, but he was able to see where Einsteinian like scientists had gone off the rails. It does require Arago's insight to come to the conclusion I hold, that rotating space , deformed and viscous is a Newtonian Fluid motive that accounts foe electromagnetic or as I prefer magneto Thermo electro complexes. However I acknowledge that in that I am no different to any other philosopher who holds an opinion that a concise system of philosophy , containing only what is necessary and sufficient to apprehend empirical Data will explain everything we currently know. My opinion or hypothesis is that rotational motion is a fundamental behaviour in and of space. Without digressing into deeper explanation that leads me to expect vortex behaviours around dense objects in which less dense rotates vorticularly about denser objects at all scales of density. Density itself is a measure of how much pressure is exerted by a region per unit surface area producted with time squared. It is a dynamic form of bound energy that exists in motion and that motion is rotational. Of course this bounded form of rotational motion which impresses on a surface area is not commonly described as such, and suffice it to say it is the fundamental aspect of any vortex. Thus I expect that around any conductor/ inductor such a vortex will exist. The effects of interacting with or disturbing this vortex are those behaveiours which have been described as electric tension or magnetic lines of Force( ie energy). While the rotation aspect of this vortex I feel has been adequately visualised by Arago and Örsted in the case of a wire antenna attached to a voltaic cell which is effectually a vortex driving capacitor; and by Faraday in the case of a ferromagnetic conductor which by its microscopic structure est"ablishes many regions of vortex driving capacitors, exhibiting on this scale the Leyden jar behaviour of storing this vortex energy. . Soon it became a current of "charged particles" that generated a vortex. However this is unnecessary and misleading. The vortex itself is sufficiently dynamic to convey the asserted energy , but what needs to be explained is why the vortex exhibits the behaviour of potential energy and how it exhibits sparks in the case of high potential energy. The first step is to define a vortex in terms of gyres, and to designate the fundamental gyres. In free space a gyre cannot be defined on its own . Any gyre is defined relatively to an observer or an agreed frame if reference. The best reference frame for tis was composed by Newton et al. Reference frames are by construction fractal and so at any point an image of the reference frame can be set up. This is also called holographic, but it is connected indistinguishable to fractal properties and processes. Points in the reference frame are ask dynamic , do if tagged or identified they move and rotate. The other fact is points lines and planes can occupy the same reference positions. In so doing they do not disappear but add a weighting to that reference position. These additional considerations are often ignored leading to unphysical models. Thus when Newyon introduced a point mass it was in acknowledgement of the measured physical reality. The rotation of a point however is generally subsumed in an axis and discounted in effect from massless equations! Even Newton ignored this in his calculus of rotations in the book on fluid mechanics. This is because the moment, a universal idea of rotation introduced by Archimedes is zero at a point! But consider, if a point mass can be said to be mathematically useful, then surely a point moment must be also useful and allowed! The next reality check is fractal regionality. The sphere as a formal concept is congruently fractal at all scales , but it does not tessellate. Thus any fractal division of a form by spheres necessarily has an infinite spectrum of radii. The Fourier transform is an acknowledgement of this athematical and formal identity. We fo not deal with infinite or infinity as a number, but as an exhaustive process. Engineers and Mrchanics know this, and do do experimental physicists. However " mathematicians" have lost the plot since Cantor! Thus we choose the best fit for any particular situation, and model from there. It is clear that rigid body dynamics avoids complex structures and makes sweeping assumptions. However fluid dynamics must deal with granular contiguous materials. In addition these grains may possess regionally different properties. The attempt tp model these Mrchanics really had to wait until computational machines were able to deal with the multiple and insane iterations required to compute a process and the computer graphic capabilities to display the results! So while general principles of processing were devised, both for computers and for human analyss( Turin et al) it really required the genius of Mandelbrot to break down silly and entrenched positions against computational analyis. The reason being that Mathematics then can be seen for what it is a sub branch of a much greater human endeavour , computational science! From Newton to Prandtl through Helmholtz etbal, the basic modelling assumptions have been wrong! TodaynClaes Johnson is the most noteable critic of current fluid and aerodynamic Anlysis. His books on how aeroplanes fly are important reading and watching. Vortices have a dual structure. They consist of shells of fluid moving contra to each other .thus a low pressure vortex usually has a low pressure region which is central and relatively calm but exiting long an axis. Around it fierce shells of higher pressure regions are pressing in toward the lower pressure lower density region. Because the fundamental motion in space is rotational these regions spiral in! As they do so they ride on a region of less dense material spiralling out. So not only is the central region of low pressure but spirals out from that region are of low pressure too! These winds or pressure regions generate shear forces at their boundaries that create counter rotations between the spirals. The vortex actually has a very curtain like structure with complex patterns of material motion. While the main acial motion is in centre other parallel axial motions are generated and tend to congregate toward the central region dragged there by the progress of the spiralling in denser material. This incredible structure is full of rotating energy , and achieve rotational speeds so great that the central region is preserved by a rotational wall which is spiralling to fast to reach the centre, instead it spirals axially in huge displays of axial energy. A vortex therefore is a vast store of energy and a potential exists radially but is more striking axially. It consists of 2 interleaved contra gyres one gyre moves inwards while the other gyre moves toward. There is a far more complex structure of gyres ith in the main gyres which affect the nature and process of the vortex. Nw high pressure vortices are clearly very similar. High pressure vortices ar where a denser material expands out into a lower density material again this motion is fundamentally rotations, and he'll like. As the high pressure spirals out low pressure regions are pushed in toward the central high. In this case the axial behaviour is usually inward as the high pressure or higher density tend to be attractive . The tree fundamental gyres are thus spiral inwards, spiral outwards nd a combination of the 2 which leads to circular behaviour. The potential in ort ices is therefore very great. The behaviours are complex, and both types of spirals exist iin a vortex at the same time. How high pressure regions are generated is a complex " gear chain" activity, but st some stage a periodically a vortex will stop and reverse its process. This was exhibited in a model of circulation made by Ed Lorenz, and lead to the foundational concepts of Chaos theory. The point is, the model behaved strangely, but not as strangely as the weather ircl ions it was modelling! The assumptions of a Mechanicl clockwork system were not physical! 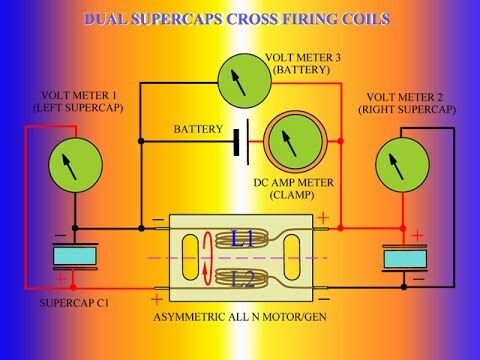 Now super caps take us out of the Galvano paradigm and into the Voltaic one. Volta announced the law of 3 materials in a circuit one of which was moist. Tesla is reputed to have been muttering the number 3 near the end of his life. The vortex or Abha coil is based on the Bahai belief in the number 3^2 or 9. This is the same as the Vedic modulo 8 system, and is a cohomology in the ring theory jargon. 3 is the minimum number of points necessary to define a circle. 3 spheres are the minimum number required to identify a unique pair of intersection points of 3 intersection circles in 3d space. Volta's rule of 3 to generate a detectable galvanic response is vital to deciphering the potential energy in vortices and vortex surfaces. The old atmospheres around objects, a kind of fluid extension beyond the dense boundary of a form, inspired Volta to invent the electrophorus, based on work done by Becania and others. It was a development of the Leyden jar principle. Volta's position was that of Franklins, adopting only 1 fluid. But he knew this would not explain empirical data without an additional attractive force in the model . While the symbols +and – were used by Franklin, they were understood as forces, not charges. Charging was the process of imbuing a form with a force. Franklins idea only explained repulsion as an axiomatic self repulsion. There was no explanation of attraction by Franklins force model. Volta points this out early in his career nd supplies the missing force to the model. In the meantime the other researchers in Europe used a 2 fluid model that explained attraction as an effect between the 2 fluids, so really, Galvano's explanation of animal electricity was admired as experimental evidence of the 2 fluids in living or biological tissue. Volta was initially persuaded by the evidence, but further experimentation revealed other factors not accounted for, and he retained his 1 fluid stance plus an attractive force to explain what he was uncovering. The point here is the idea was to keep explanations as simple as possible. One fluid with attraction however is clearly the same as the 2 fluid description! It is the 2 fluid description that Inheres what we call potential energy. However by using one fluid the second fluid has to become the material of which the fluid is a part. Thus franklins idea divides matter into 2 subtypes not 3 , and any potential exists between these 2 subtypes , not between the 2 fluids. . It avoids the additional issue of how the 2 fluids attract to the third neutral subtype. Any posited attraction negates the role of one of the fluids! So the atmosphere idea Inheres the potential that exists between attracted materials, but the self repulsion has to apply to the fluid and the other subtype. There are thus two potentials, that of repulsion and that of attraction. With an atmosphere these forces are embodied. Without an atmosphere theoreticians invented the unsatisfactory notion of action at a distance.Later Faraday reintroduces the " atmosphere" concept under the notion of a sphere of "influence" .later this was termed a field. The potentials thus are now embodied in the abstract concept of a field, but it really is hardly different to an atmosphere analogy. Volta's theory was that equilibrium by spatial configurations in the field are disturbed by other atmospheres interacting leading to a dynamic restabilisation. The old idea of statics included the dynamics of zero sum forces in inertial frames, a Newtonian idea. So much of electro and Magnetostatics is not static at all! 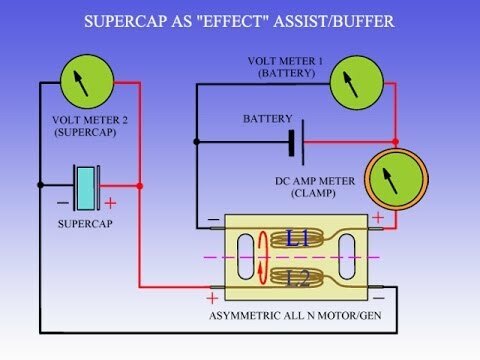 This is crucial, as Ivor Catt has demonstrated that capacitors are dynamic stores in which the energy is continually reciprocating until released. Reciprocation is just a term to avoid saying vortex! Volta used an electroscope to measure the self repulsive force, which I might call electric tension or potential. As far as I know only Arago used a versorium in this regard. The behaviour baffled researchers who had not yet received Örsteds results defining a circular magnetic behaviour. In this light it was clear that a moving electric tension was just like a moving north and south pole, in fact like the north and south poles were able to rotate contra to each other. This was hard to understand and no one wanted to rethink the electric and magnetic bodies of knowledge , nor indeed knew how. The term electrodynamics was coined and also magneto dynamics. A debate broke out dividing into camps those who thought that the separate forces , separated by human convention not reality, we're hierarchical, with electric or magnetic being fundamental to the other. I see or read of no other experiments done to determine the self repulsion in the posited fluid or fluids by both the versorium method and the electroscope method. Lost another post to the aether? That one was a sketch on electric potential as magnetic radial attraction or repulsion. Any how, maybe not time to reveal that idea who knows. Watch this! Way to go ladies! I feel I have made the point that magnetic behaviours are rotational vortices which include electric potential behaviours formed around a vortex core or guide that we call an inductor/ conductor. This kind of says it all for me. We had a chance to completely build physics anew on the basis of Rotation, but reactionary , entrenched positions prevented and buried that realisation! I was pleasantly surprised to find that Andre Marie Ampere developed his Electrodynamic theory on a scale free Fractal loop concept and that it is essentially Joseph Newman's theoretical gyroscopic model of Magnetism: repulsion and attraction. So now we have a fractal loop theory of magnetic "particles" invented by Ampère. We have to realise that current flow in a wire was a very much later concept. Both Örsted and Ampère were not convinced of it. Rather they both imagined the behaviour as circling round the wire in some atmospheric way. In Volta's time it was standard that materials had atmospheres, or fluids. Thus the electric behaviour was envisaged as requiring to opposing fluids, one attractive one repulsive. Franklin decided it was easier to consider the behaviour in terms of one fluid, and although he had adherents to his style in Europe most Europeans followed Galvanis 2 fluid model, mostly because it could be easily demonstrated it was thought in animal tissue. Volta was disabused of his early opinions by some " rough" handling by the reigning professor of magnetic behaviours in his area, and he was an ardent Fanklinite! However Volta reasoned Franlin's model was deficient unless an attractive force " somehow" was added to the theory. The 2 fluid theiry lost ground only in the academic literature. Engineers still use it confusingly as positive or negative charges moving in the wire! However we do not have to remain ignorant using + or -. We can returbpn to the 2 fluid model and extend it by radioactive thery! Radioactivity in fact has many fluids or atmospheres. æ,ß.¥ ( alpha, beta gamma) . Today we may call these fluids plasmas. The loop theory of magnetism can be applied to these fluids giving us opposing magnetic behaviours around a neutral behaviour. Eds simple observation and deep understanding of these early scientific theories enabled him to describe these contra spiralling vortices that spiral around a neutral central vortex. All materials are " radioactive" ! Thus background radioactivity is equivalent to the fluid models that supported the atmospheric descriptions of materials in earlier times.
" electricity" is a dynamic combination of magnetic loops of electron helium and neutron materials, or plasmas. I have completed listening to Eric Dollards synthesis of Energy video, approximately 4 hours on YouTube. I have learned a lot from Eric's researches over the years, but the most important thing is that our current explanation of Electromagnetism is a broken model that is used to blind us to certain elemental powers. I came across Ivor Catts work, which similarly is a return to Heaviside analysis of these powers. Both these men have presented a cogent argument for advancing the study of Electromagnetism on the basis of Non Maxwellian theoretical developments and empirical data. For meat this moment it is clear that these powers exist in free space. In free space they demonstrate a structure that is filamental but invisible. That induction into spatial forms develops particular behaviours that are best described as vorticular , and these vortices are of a complex rotational structure which nevertheless is common in many visible materials in nature! Empirical observations and experimentations have one goal, and that is to derive a metrical system to measure these powers! The measurement of these powers has thus distorted the free space behaviours of these powers, but more importantly have distorted and blinded our empirical observation . It has allowed some to take control of our knowledge and interaction with these powers. The cry for free energy is in fact a cry for freedom from these controlling oligarchies! Our understanding of material space has gone through many revisions. Today we must be aware that commercial interests control our understanding and ability. To understand magnetism we must abandon it as a fundamental power. I have sought over many years to peek below its hood to see what is going on, what drives magnets! What I discovered is that I was looking in the wrong direction. I needed to look at how I looked at magnets, how I thought and understood things, at my epistemology. Gradually I realised I could not explain anything or understand anything without accepting some experiences as fundamental primitives. That means that these are beyond any human power to analyse further. They are thus the fundmental building blocks of any synthesis. But our minds will not accept this fundmental limitation. That is when I found out about Fractal geometry. I have spent years attempting to understand how the human mind constructs geometry. In so doing I liberated myself from many conventions, and found philosophers and Thinkers, doers and builders who could direct my studies. I coined liberating words such as Spaciometry, Manipumè and fractal entrainment to allow my thoughts and meditations to grow freely and unrncumbered by conventions. But the biggest freedom was the fractal principle enunciated by Benoit Mndelbrot of " almost self similarity". The Mandelbrot set in its iconic graphical form is a dynamic that illustrates that principle and makes sense of scle free forms at all levels, where levels is a concept tautologically defined by the scle free forms! We know we have reached a new level when a familiar form reappears! This unending cyclicity in almost self similar forms is what allowed my ceaseless enquiry to park itself in an infinite loop, happily! It is this realisation that this solution has been found repeatedly throughout human experience that builds confidence that our technologies are not built on certainties, but on dynamic equilibria which are unfathomsble. What we experience is truly magical! The radio engineer, the telegraph engineer, the electronic chip designers who fundamentally interact with these material and invisible powers in and of space gain insights that are passed on within their guilds. But those guilds compete for economic and social power. The aristocracy have ruled in one form or mother that dirty technicians and mechanics shall not be their intellectual superiors! So it is that our theoretical academic expositions are so so wrong headed! The new aristocracy, the commercial elites reiterate the same controlling paradigm, but they justify it as protection of industrial and intellectual properties! This is why many serviceable and revolutionary ideas litter the archives of the Patents Offices around the world, and why academia is so quick to condemn or ignore the work of the garage inventor. If you are not in the Acadmic club you must be silenced at all costs! Ed Leedskalnin is no one special! He represents ll of us ordinary men and women who tinker with these fundamental powers in our kitchens, sheds garages etc. His common sense observations can be made by all of us. Today we have technology that makes recording of data even easier. What we give up on is the analyis and synthesis of that data into a philosophical exposition. Ed did the thinking. So let us be clear! Ed did the thinking, he did not do the Math! Why is that important? Because the math is meaningless without the thinking. It turns out that Ed apparently read quite widely. We have identified ideas from Örsted, Ampère Gilbert, Tesla and others in his quaint but powerful style of explanation. He clearly read and understood a lot of the philosophy of the pioneers of electro magnetism. His implement questioning of the electron seems heretical today, but in fact it was quite common to doubt this constructed entity. Even JJ Thompson doubted it as a reality. It is clear that the first world war changed everything. Einsteins ideas were not well accepted before then. A crisis in Physics as well as in the geopolitical situation lead to a rapid and forced reorganisation of academic paradigms. War lines were drawn to distinguish friend from foe. The aether concept was ditched in America and western Europe outside Prusdian and eventually Nazi control. Much of what Ed learned was from the textbooks in the library. The latest ideas were top secret and not available for public scrutiny. Nevertheless ed determined he had enough to understand the right basis for further research. It was magnetism. Today , if you YouTube " history of magnetism" you will find that he was right! Electricity has become closed off by the creators of the electron. It is a dead field with no further development possible, without ditching the electron. Magnetism is the new research area, and the fundamental primitive behaviour that is needed to explain all. Perhaps since Volta who suspected the behaviours of interacting atmospheres as the source of electric " current" but was overruled in favour of Galvani, but definitely since Örsteds philosophical theory and demonstration, followed by Arago's definitive rotation disc demonstration, amoères loop theoretical explanation and Faradays magnetic lines of force demonstrations philosophers have known , but refused to admit that the behaviour of magnetism as it swirls around a wire is the fundamental determiner of electric behaviours in materials and continuous induction ( conduction) in a wire . We now know what philosophers of these behaviours suspected that at least 2 fluid plasmas are involved in the boundaries of these material forms that exhibit the observed behaviours of Electra and magneto attraction and repulsion, and that in experimental fact there are many more but we can perhaps make do with3 as primitives: the Alpha, Beta and Gamma plasmas described as " radiations". While relativity may be said to be Einsteins big idea, it is in fact an old philosophical realisation that began to enter into the description of Measures due to the ideas of Galileo. The fulfilment of these observations of relativity were worked out in geometrical terms which are purely metrical phenomena and behaviours. Like the Tortoise and the Athlete, Zeno's paradoxes teach us our focus and metrical systems lead to unnatural or unphysical conclusions, but if we are going to maintain those metrical systems we need to understand how to use and interpret them. In the past that simply meant discarding mathematical results that seemed to have no basis in empirical data. However the philosophy upon which the Maths may have been constructed often contained valuable insights and observations. The practice of pinning your colours to the mast often meant many valuable bits of empirical data were lost when the ship sank! Today if we want to we can redact all our clumsily built theories and models and start anew. Today many more natural philosophers can on tribute their insights and observations to make a better model or better models! The only thing standing in our way is the status quo! 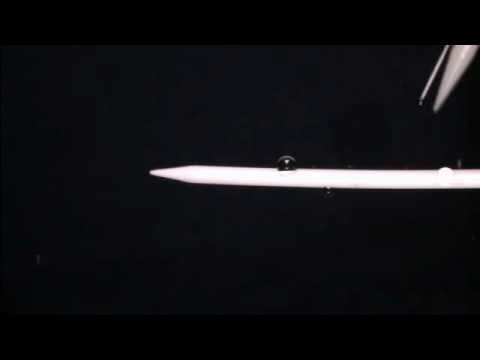 This series of demonstrations by Tinmanpower YouTube channel actually shows the plasmas that run around and through a wire as magnetic currents. The structure as Ed deduced is 2 opposite spinning vortices, but one travels around the outside of the wire the other one travels on the inside of the conductor/ inductor! They both leak into the environment which was how ed collected them in separate ends of his fishwire magnets set at right angles to the wire. Do they travel in opposite directions along the wire ? Experiment suggests that they do . Ivor Catts Wakefield experiments on a coaxial cable acting as a transmission line shows this reciprocating current flow within the cable. When the cable is allowed to release its stored energy the energy flows round to exit at the open end. Where did the reciprocating current shown as a step voltage transmission come from? Ed states from both terminals of the battery. But now we can see the structure is not just spinning against each other but mostly spinning round each other in an inside outside fashion!